We have personally measured using this measuring wheel. We can say that the product has a nice weight to it and feels like a quality product when you hold it. The welds look good, the counter works good, the entire product is built to last. We're proud to be selling this high-quality product. -EngineerSupply Product Team. 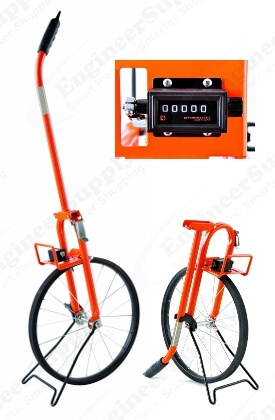 This Measuring Wheel measures in Feet. The Wheel is 15-1/2" Diameter, and 4 Foot Circumference. If you want a quality built tool that feels good in your hand, EngineerSupply recommends Keson. Simplicity and durability were two principles that guided our design of the Metal Professional Wheel. The result is a wheel that rolls easily over the most difficult terrain and can stand up to constant heavy use. Innovative, simple centerline design, great balance. Rugged 3/4" steel tubing, the strongest frame in the field. Time-tested proven counters with huge numbers. Only two moving parts (reset and ticker) mean fewer things can go wrong. Superior counter protection and placement—5-digit counter. Up to 99,999 feet. Compact folds-down—easily to reduce to half its size for storage and portability. Storage is a snap.